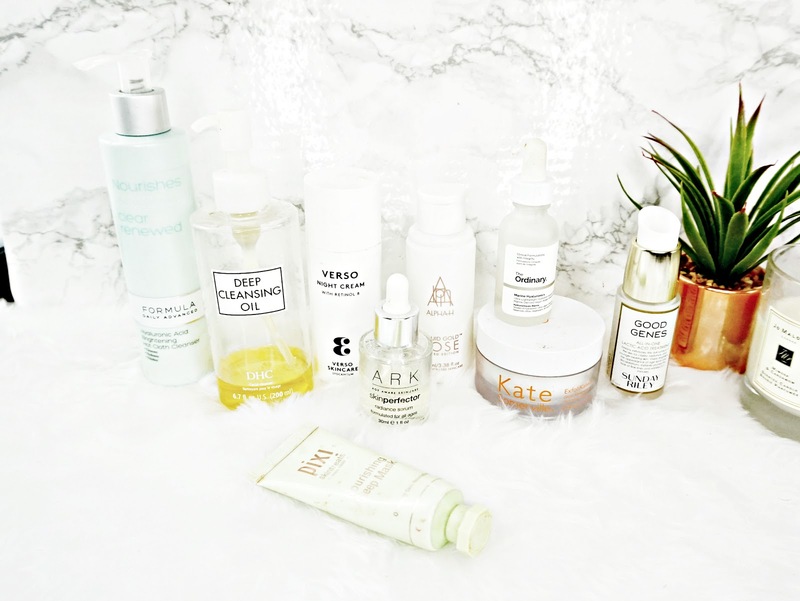 I talk a lot about skincare, my favourite skincare and so many roundups of skincare but I rarely ever share my actual routine. And I think it's important too because I find it's a combination of products that work well rather than one. Today I'm just keeping to my evening skincare. Keep an eye out for my morning routine soon. I have dehydrated skin, that lacks glow. But with these products I've managed to keep my dehydrated skin at bay and give it a bit of a glow. I do adjust routines depending on how my skin is feeling or if I have any breakouts but for the most part this is my routine. First of all I like to remove my makeup with an oil. This DHC oil is by far my favourite. It melts down all makeup including water proof. It also emulsifies really well when mixed with water removing all traces of makeup. It doesn't leave a film on the skin or make my eyes cloudy. For my second cleanse I like something rich and nourishing. I just find it a lot nicer on my skin than something foaming. I've been really enjoying this one from Formula which is one of M&S's own skincare brands. It doesn't have a scent and has never caused me to breakout. It removes really easily with a hot flannel, leaving my skin soft, smooth and not stripped at all. Next I like to use a hydrating serum. This one from The Ordinary has been my go to recently. It has a really watery consistency that absorbs really quickly. It really helps sooth any dry areas and skin looks so much more plump in the morning. This serum from Ark is a brightening serum which also contains Vitamin C. Vitamin C is a powder antioxidant that helps fights free radicals. This serum has really helped brighten my skin! I've been using AM and PM and works great in either routine. Lastly I go in with a moisturiser. I really love this one from Kate Sommervile in the evening. It's an AHA moisturiser that gently exfoliates the skin. Which this really does. It leaves my skin feeling so soft and smooth and definitely helps boosts it's radiance. It's also really hydrating to. The directions do say this can be used in the morning to but to be honest I find the cream a little heavy for that. I rotate the Kate Sommervile moisturiser and this one from Verso. This one contains Retinol which is another great ingredient! It works overnight to plump, renew and restore the skin. This has some pretty amazing results. It leaves my skin so glowing! It's actually also helped reduce my hyper pigmentation. And I don't but this has made my skin look less see through like it has more colour or something! It's amazing. Treatments I switch in and out. I have a few overnight treatments that I don't use everyday but that have really helped with any skin issue I have. This stuff is like good skin in a bottle! It's an AHA treatment that comes in a toner form. But don't let that fool you this stuff is far more powerful than a regular AHA toner. It can be used alone or layered with other skincare for a less intense result. Alone this really makes my skin glow and look a whole lot brighter! Another AHA treatment I use 2-3 times a week is this lactic acid one from Sunday Riley. This has more of a moisturiser consistency but I still use it as a serum. This stuff is so gentle yet effective. It eats away dead skin cells overnight to reveal more refined, radiant looking skin. If my skin is feeling particular dry or looking like it needs some hydration this is what I reach for. This has been a long standing favourite of mine for years! I use it as a last step, after all my serums and moisturiser, to seal everything in. And boy is this hydrating. My skin looks so much more plump when I use this. My dehydration lines are gone and my skin is so smooth! When I have breakouts I reach for this little serum. It contains Salicylic acid which is a great ingredient for oily blemishes prone. It's an AHA and works in the same way by exfoliating the skin but Salicylic acid can penetrate the skin much deeper. I don't like to apply this all over my face just on the active breakout because it's too drying for me, but just on blemishes this dries them right out! It also helps to speed the whole healing process of spots. In the morning any blemishes look significantly small, less Red and less angry. That's my current routine and the treatments I like to use.